When Life Strikes, Write in Bathroom Stalls. 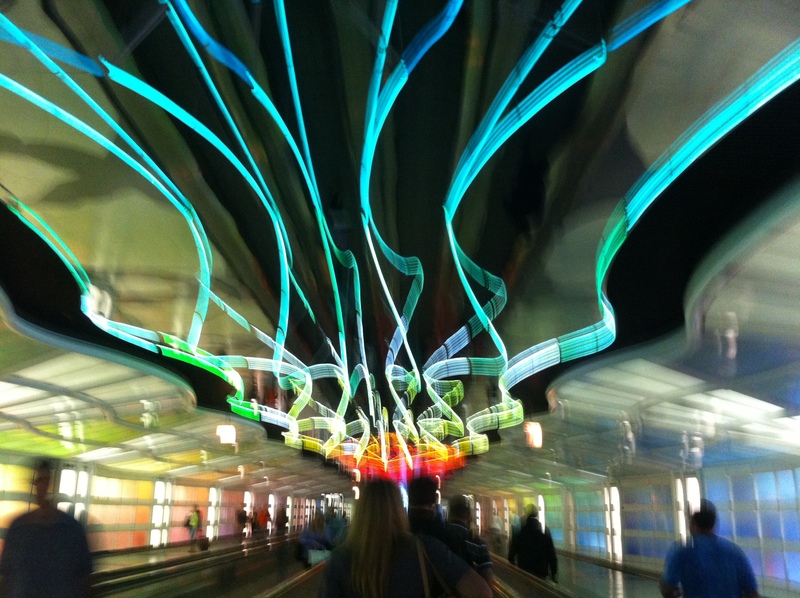 Layover at O’Hare: Writing Time. Last Thursday, I was on my way to a quick lunch break when my phone vibrated. Call me immediately. My mom. I was still tired from the night before, where I’d run around trying to grab things for my dad who was camped out at the ICU with his mother, my grandmother. But I had gotten a text from Dad earlier that day: She’s doing better. Might be able to leave next week for therapy. But that’s not what Mom’s voice relayed as she sobbed into her phone. The next thirteen hours was spent in a dark ICU room with my family. And by the time we left that night, my grandmother had gone just like the other people who had left earlier this year. Four days bereavement, spent doing little things for Dad to keep him afloat, spent connecting with aunts and uncles who live far away, spent taking people to the store and taking people out to dinner and taking people around the lake just to get them out of the house. And it ended with the Celebration of Life. And I started to think to myself, when is everyone going to stop dying? This is my third journal entry for this blog, and it is the second one pertaining to loss and grief. With my friend gone, both my grandmothers gone, it just seems like it never ends. It seems like life never gives you a break or stops being hard. I brought this up with another writer. I said that work wasn’t going any slower, the ten hours days were sliding to twelve hours, and the twelve hour days slid to fourteen hours. Planning for weddings and funerals were a lot. And how can you keep writing through it? Her answer was simple: She locked herself in the bathroom when she absolutely had to write. Because writers have to write. Writers must write. It’s not optional. It’s not up for debate. And I realized she’s right. So the night after the memorial service, we bought a new desk chair. I write every day, no matter what happens. If my parents need to go out to eat, we go out to eat … and then I come home and write. If my work needs me an extra hour or so, that’s fine … but I will come home and write. It is exhausting, but if it’s what I want out of life, then that is what must be done. The interesting part of a low-res program is that you sometimes feel alone. You aren’t living on campus, and you don’t see your professors every day. You are still out and about in your own life that you’ve created for yourself. You still sit with your family in the ICU. You still come home after a long day at work. You don’t close yourself off and only focus on your craft. But honestly, I think this will make me a stronger writer. First, it teaches me how to write in bathroom stalls. My life isn’t going to be spent on a college campus, and I have very little wiggle room with money, so I know I will be working most of my adulthood. This means I will need to learn how to squeeze that typing time into airport layovers, lunch breaks, sick days, and family vacations. But it also means that instead of being immersed in the craft, I get to be there to experience my life here in my hometown. I was there for my family. I was there to share the pain and carry part of the burden. I know what it’s like to build a home with my fiance. I get to experience those airports, those lunch breaks, those sick days, those family vacations. So tonight, I hope you go home and write. Even if it’s a page, a paragraph, a few words strung together in a good first line. Just do something. And then go out and experience something. Feel something. Write. Live. Write about Living. It’s a balancing act. And we can do it.